In 1963, Paul Kinsey and other bohemians (would-be and actual) were bemoaning the death of Penn Station. Before the rubble was even cleared from the site, the future of architecture was happening uptown. Edward Durell Stone’s 2 Columbus Circle was a 12-story Modernist structure with a curved facade, portholes, and windows that ran around the top loggia. 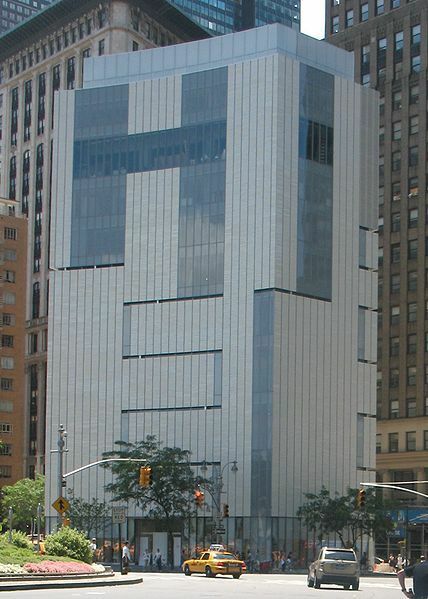 Reviled by architecture critics of the day, Ada Louise Huxtable (she of the Penn Station Preservation Campaign) noticed the stilted base and called it the ‘lollipop building’—a decidedly uncomplimentary nickname that stuck until the building’s appearance on the World Monument Fund’s 2006’s Most Endangered Building List. The redesign of 2 Columbus Circle, you see, inspired outrage in some of the very critics who, decades earlier, lamented the replacement of turn-of-the-century Arts and Crafts structures with Modernist oddities. Particularly symmetrical was Ms. Huxtable’s assertion that the building had come to give her “a little lift, a sense of pleasure” whenever she passed by. Alas, the Museum of Art and Design ordered a total overhaul of the building, one critics and commenters alike called alien and unfeeling. Always look forward, eh, Don? Can you imagine if Penn Station had been “overhauled” by dry-walling the wrought-iron and giving it a Brutalist facade? I love old buildings—especially Beaux-Arts rail terminals—but a clean death is preferable to afterlife as a zombie.